We offer a full range of adapters. We carry a large variety of high quality microwave RF adapters. These coaxial adapters are designed and manufactured for low VSWR and low insertion loss. The standard offering covers the frequency range from DC to 40 GHz and includes various interface options from BNC to 2.92 mm (K) connector types in both male and female interfaces. If you do not find the connector or adapter that you need please contact us. 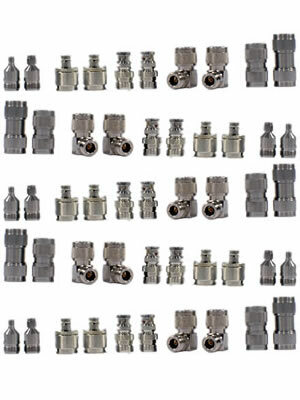 We add connectors and adapters to our inventory faster than they can be added to the website and should you require a connector not shown we may have it.